Chip and Joanna Gains reveal to Harry how they first met. 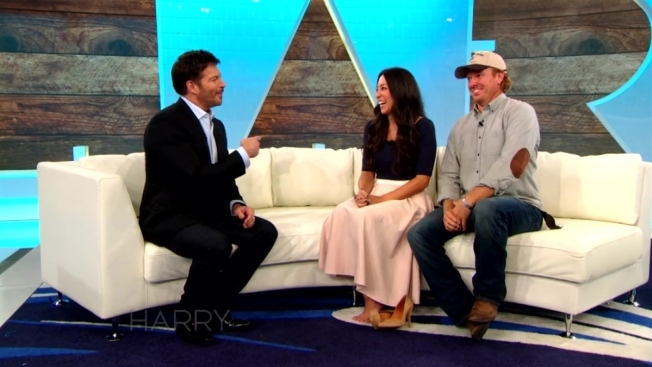 Joanna Gaines and Chip Gaines put on a united front on NBC's "Today" Thursday amid recent reports about their marriage. The stars of the HGTV show "Fixer Upper," who have been married for more than 14 years and share four kids, have been the subject of divorce rumors for weeks. In addition, there have been unconfirmed reports Joanna Gaines is leaving the series, which she has denied. "You're not movie stars. You didn't grow up in the spotlight. Are you prepared for these types of things?" asked Today's Jenna Bush Hager. The couple answered with a resounding "No." "It's funny, I mean, when I think about these circumstances, I think they're hilarious," Chip said. "I'm like, I can't believe that these things are happening to us. Because part of me thinks, who would care about that?" "I think for me, even from the beginning, just because I don't do great with seeing that kind of stuff, reading into it, I just don't know what's going on. So then I'll hear someone come up to me and say, 'I hear you and Chip are getting a divorce.' I'm like, 'Where did you hear [that]?' I don't know any of this is going on," Joanna said on the Today show as Chip, sitting beside her, nodded. "So we do our due diligence in letting people know as much as we can, 'This isn't us. Don't be scammed,'" Joanna continued. Chip had previously addressed the divorce rumors in August on Twitter. He responded to a user who expressed feeling "sick" over the reports, tweeting, "Won't ever happen.. you can take that to the bank! #loveOfMyLife"